(eastern Caribbean island of Martinique). Taken with an Ipad from the deck of our live-aboard ketch, Roxy. Rain swirls over Mount Pelee. 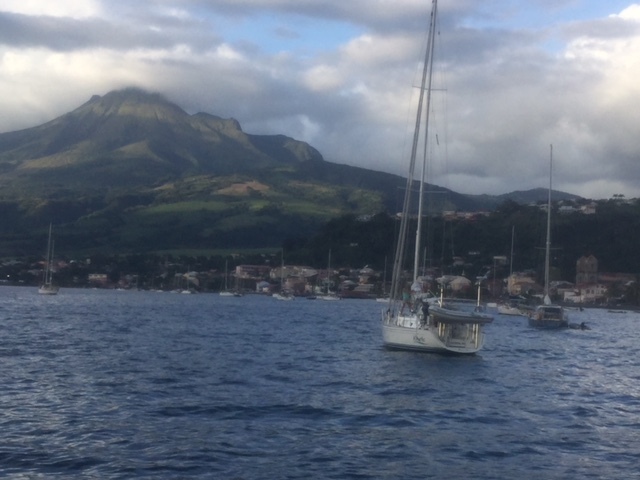 Martinique is one of a string of volcanic islands. Mount Pelee, 4500 feet, at the north end of Martinique’s backbone is one of the highest in the Caribbean. Pelee erupted most recently in 1902, burying the town of Saint Pierre, 30,000 population. The lone survivor was a prisoner in the drunk tank according to legend. The high mountains cause near constant rains from the persistent easterly trade winds. The high elevations are tropical rain forests. A hike to Pelee’s summit from Saint Pierre is an aggressive long day of climbing.